Technology is changing. 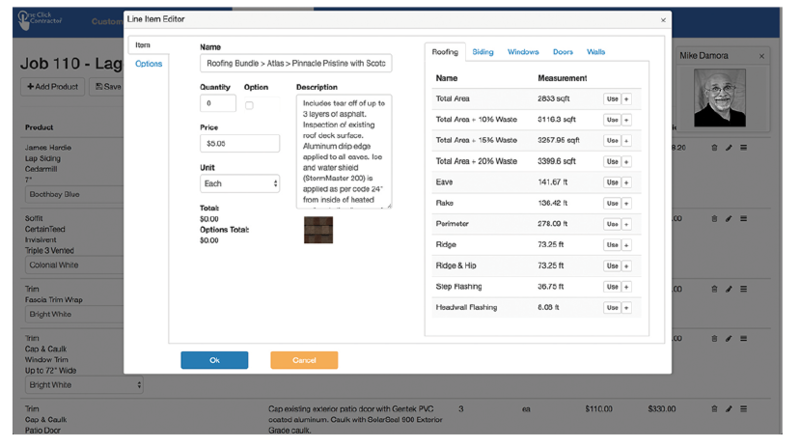 Contractors today can select from a whole variety of tech tools that enable them to track leads and sales, take measurements, produce designs, prepare estimates and proposals, and more. But until now, all of these functions pretty much operated independently of one another. A company that uses a CRM system to track leads and sales might also estimate jobs using other software or do it the old-fashioned way, using pen and paper. So what if software could collect all of the separate functions essential to home improvement sales into just one application? That’s the idea behind Remote Sales Force and its digital product, One Click Contractor, an idea conceived by Kusnier and Mike Damora, K&B’s vice president of sales and marketing and a Pro Remodeler columnist. Below is a step-by-step walk-through of the sales process using One Click. For a more detailed look at the product and the associated tech changes in the industry, take a look at our in-depth article "Online and Ready to Buy: the New Sales Landscape." 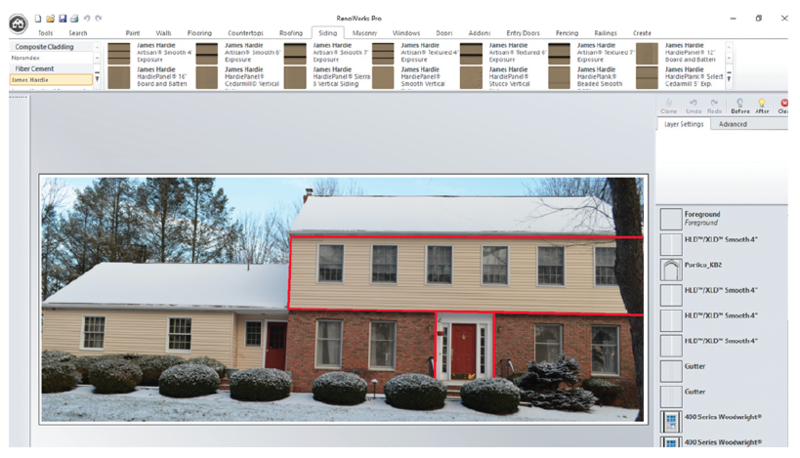 2] After photos are “digitized” (to permit measuring and product visualization overlays), software calculates relevant dimensions (e.g., roof and wall plane area, linear feet of trim, size and number of windows, etc.). 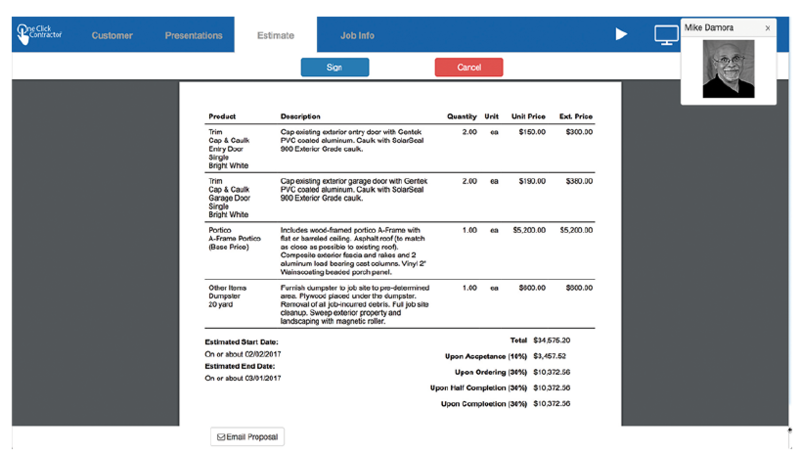 3] Software combines itemized quantity takeoff information with product descriptions and pricing to build a complete proposal customized to incorporate contract terms and conditions, payment schedules, and other boilerplate. 4] Contractor arranges online video conference, during which design and proposal are presented to homeowners via shared screens. As homeowners change product selections/add or omit features, visual and pricing changes are immediately reflected on shared screens. 5] Homeowners digitally sign contract, either during video conference or at any time before the proposal expires. Deposit can be paid by check, credit card, or electronic transfer, after which installation is scheduled. I have already created custom software to provide quick, accurate and highly detailed contracts for our clients. It also figures accurate roofing waste figures, attic ventilation, gutters/downspouts, attic insulation, siding, windows and will soon have solar power generation calculations included. Our software also generates and includes all mandatory disclosures, material takeoff lists, final checklists, final invoicing, and more. Yes, technology is the wave of the future. We measure with drone photography when possible and many other methods. What is really great is getting nearly 100% of our insurance supplements properly settled (including overhead and profit) without the need for outside adjusters, mediation experts or attorneys. Honesty, integrity go a long way with the insurance companies. If we do not complete a trade, we let the insurance know and the reason for the change or omission. Building codes are to always be followed. Insurance adjusters need to have building codes provided. 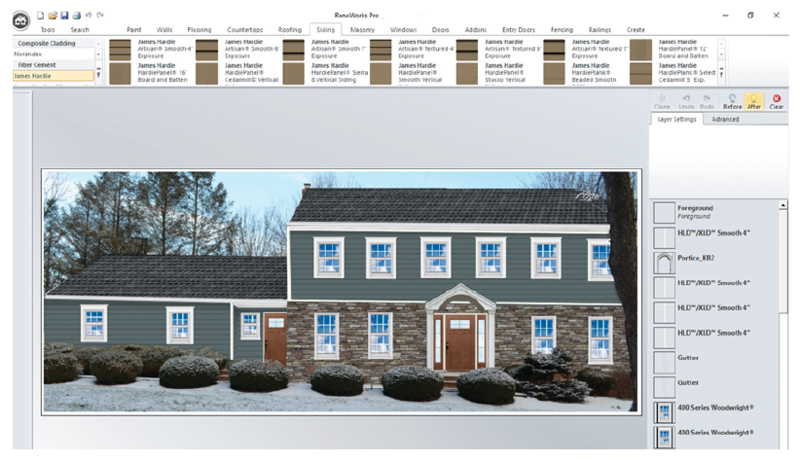 Building an image of the client's home with the new claddings and fixins is now easy to accomplish with the assistance of the various manufacturer's apps and software for emulating their products onto photos. Photography is so important nowadays for our clients. Educating the customers makes a big statement about your company. This product brings everything down to price. There is no warm up, no interaction to find out what the client really wants, no bother about the company and what sets them apart from the competition. It's all about price!